I spend Chapter 5 of my new book, The Invisible Sale, discussing the strategic shift content marketing oriented sales & marketing teams must accept to find and win the invisible buyer. Today’s buyers are looking for advice not advertising and the brands that figure that out and successfully deploy that strategy first will enjoy enormous first mover advantage. My friend Jay Baer calls this approach YOUtility. And while I touch on the subject in the overall discussion of finding and winning the invisible sale, Jay dives deep into the concept of helping versus selling content in his new New York Times Bestseller — YOUtility. Jay was nice enough to give me an advance copy when we last saw each other and I read it cover to cover the next day. YOUtility is full of great information, better ideas and something like 35 case studies that Jay plucked from the real world examples he both sees and has helped create. His Top-of-Mind-Awareness to Frame-of-Mine-Awareness to Friend-of-Mine Awareness to reminds me of my own Propinquity Marketing approach. I also loved Chapter 12, Keeping Score, where Jay talks about various approaches you might take to metric your efforts and establish the all important ROI. 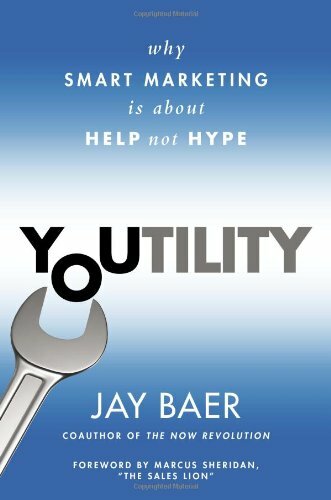 Best of all, Jay doesn’t just talk about YOUtility, he gives you Six Blueprints to Create YOUtility so that you can go from reading about YOUtility to actually creating it in your marketing efforts. If you read the archives here you’ll notice that I don’t review and recommend books often, but this is one that you should purchase. Jay is truly one of the smartest folks you’ll find in the digital marketing space and he’s offering a ton of that insight to you for less than $20. Be smart and take him up on it. Thanks so much my friend. I appreciate it, and can’t WAIT for your book!!! Please thank Sean McGinnnis for without his post, I don’t get to read Tom’s article to learn about Jay’s book–which has since been purchased via Kindle! Thank you both for doing what you do and especially helping others. We raise our glass to all three of you! Well thanks Martin — which Sean McGinnis post are you referring to? Me thinks me missed a memo.